Tracking links an page visits on your website is a very important measurement to figure out what is the most preferred page or blog post on your website and what are your Leads/Contacts mostly interested on your site. With Flexie CRM you can analyze page visits, track link clicks and much more. You can have in-depth information on what your Leads and Contacts are mostly interested inside blog post, if they start playing a video you may have embedded and if they see it completely or just a few second. All this information can be logged back in the Lead’s or Contact’s profile making sure you can analyze and generate insights on what’s really relevant. Measurements and metrics tools are key in running a successful business today as the market is way more competitive than ever was. With Flexie, beside page visits and link tracks, you can also visualize your Leads and Contacts behavior on your website by using the new Metadata feature. You can pass arbitrary objects to Metadata and get that insight in your Leads or Contacts profile. The information saved in the Metadata object can be a page scroll, a video play, detail views of the Lead or Customer in your website. On a video gallery, you can check what’s being watched more and whats more interesting for your leads and contacts. Knowledge is power and having this power in hand you can use it to leverage your business success. An live example for the Metadata implementation is presented here with a code example which we are going to analyze step by step. The example, tracks three basic events like Play, Pause, Finished for a list of videos in a Video Gallery. In the above code, the videos will be embedded in an IFrame HTML element with a CSS class named “elementor-video-iframe”. Then we know, that all the gallery videos will be embedded under this CSS class. We create a method createplayer where we construct a YT.Player object that will embed the YouTube videos under the selector defined in the first argument player . Videos will be embedded under elements with class ‘elementor-video-iframe’. In the createplayer method we listen for three events and use Flexie Tracking script to capture when those events happen as a hitEvent with an associated Metadata element that will hold details on this hitEvent. When the API will load, it will call method onYouTubeIframeAPIReady which will call the createPlayer method and the YT.Player will embed videos and listen for the three events defined. Whenever one of the events happens, we save important information like what the event was, at which video this event happen and duration details. For this metric to work, you need to include the Flexie Tracking script on your page. Also, you will have logged in your UTM variables in Leads or Contacts profile if they will be coming from an external source or a paid campaign. From the Workflow Engine, you can listen for Page Visits and create detailed flow whenever some of the events described above happens. 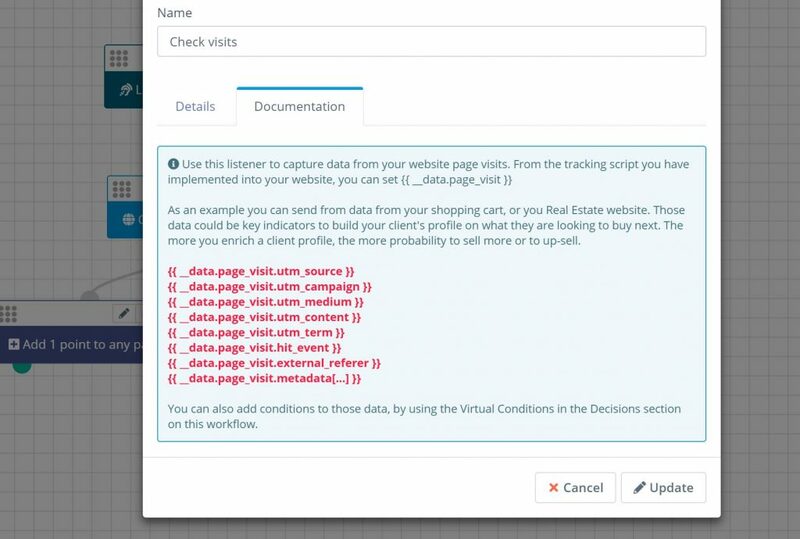 The Metadata information will be displayed in the Leads or Contacts activity as well and you can create very dynamic statistics over those metrics.